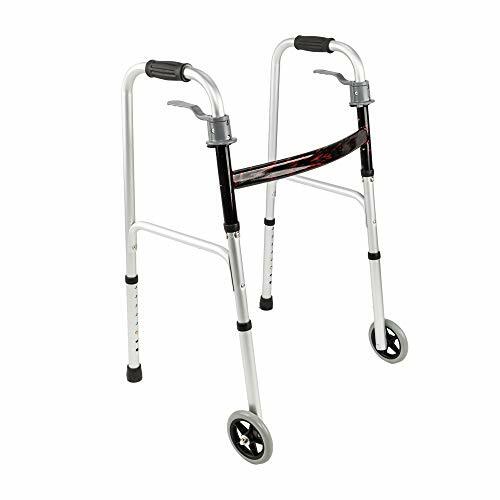 For a safe, convenient aid to performing daily activities, a walker can be the ideal solution. Mefeir's new Folding Walker combines the strength and durability with lightweight ease of use. The walker features a unique trigger for easy folding and adjustable height customize to your height. Its triangular shaped (front and sides) frame offers greater stability. The sturdy aluminum alloy steel frame holds up to 350 lbs and 2 wheels on the front allows you move around smoothly with safety. ULTRA-CONVENIENT: This walking aid moves forward and backward easily with two wheels so that you can travel over a variety of terrains. The height can be adjusted in 8 gears, suitable for users of different heights. It is perfect for seniors on the go. LIGHTWEIGHT: The light but very strong aluminum alloy steel frame allows you to easily fold up the walker so that you can store it or transport it. Its triangular shaped (front and sides) frame offers greater stability that holds up to 350 lbs. MOBILITY AID: This walker is certified by FDA, safe and reliable. It can be used as rehabilitation training tool for paralysis of lower extremity at home. It helps patients to keep balance, support weight and assist walking. ASSEMBLE & STOERAGE: The package comes with 1 piece of walker with wheels only , which is very easy to assemble. NO TOOLS NEEDED. Product Dimensions: (20.87 x 14.96 x 30.71-37.79)" Folding Dimensions: (32.68 x 20.47 x 3.94)"
FAST SHIPPING: This walker stock is available in domestic satisfied your urgent use.